Sharma’s first adult contemporary romance kicks off with a bang! Selecting this story, I didn’t know what to expect, but I am so glad I picked it up. 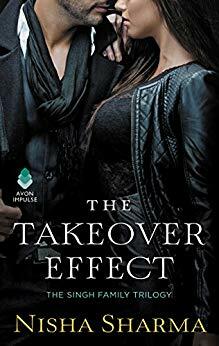 This is one of those books that reminds me of high stakes billionaire romances—swanky lifestyles, cars, locales, and plenty of designer clothes. Sharma blends this with a unique cultural background, think Crazy Rich Indians. At the core though, this is still the billionaire trope with a few twists… corporate espionage, hostile takeovers, and negotiating the boardroom. There are added cultural elements that give these tropes some fresh takes and I love the business heavy aspects. For some who are not into the business, corporate jargon this might be a turnoff. As for characters, Sharma’s world is nice and rich. With plenty to play with from hero, Hemdeep Singh and his two brothers to Mina, our heroine, and her bestie Raj who is rich and successful all on her own. The Singh’s are Punjabi Sikh’s who are intelligent, attractive, and big on honoring their family by protecting their father’s accomplishments. In this case, Hemdeep must return to his father’s business to help save it from a hostile takeover. Hemdeep walks a fine line between supportive alpha male and alphahole. Though if you are a fan of alpha males then you will enjoy this hero. I liked him, but sometimes questioned his actions or reactions to situations involving Mina. The reason I could accept things is because Mina is extremely strong-willed and not to be messed with. I came to believe that if Hemdeep did anything she didn’t like he’d know about it. As for Mina, absolutely could get behind a woman seeking to find her way in a world of men who are trying to control her and to follow in her mother’s footsteps as a lawyer. She’s career focused, dedicated to her job and goals… none of those involve a man, until Hemdeep. The story is easy to follow and get behind. The outlying and romance plots develop quickly, and at times I felt a case of insta-lust, but this is a romance after all. Can’t waste too much time letting things play out slowly, besides I enjoyed how Hemdeep felt a connection to Mina and pursues it. There is a villain in this piece, a swarmy one, and a satisfying ending that will please anyone who enjoys seeing a bad guy get his just desserts. Overall, this was a quick page turner for me. An easy story to get lost in and one that made me commit to the rest of the books in the series. I eagerly await the next brother’s story and can only hope his heroine is Raj. For readers who enjoyed Lauren Layne’s Wall Street series or think the Indulgence line with Entangled.